Amidst the thousands of square feet of laboratory space at Arizona State University’s Polytechnic campus in East Mesa, one new building will be constructed to house religion classes and services of the Church of Jesus Christ of Latter-day Saints. 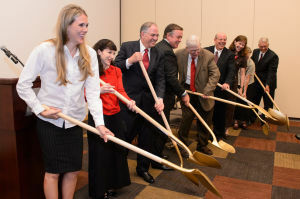 A groundbreaking ceremony for the LDS Institute of Religion building was held Sept. 9, with special guests and speakers, ASU President Michael Crow and Elder Neil L. Andersen of the Quorum of the Twelve Apostles of the LDS Church. Also in attendance were mayors John Lewis of Gilbert and Gail Barney of Queen Creek, as well as Mesa vice mayor Alex Finter. Among the other elected officials attending were Maricopa County supervisors Steve Chucri and Denny Barney, state Reps. Justin Pierce and Douglas Coleman and state Sen. Bob Worsley.